Ceramic lined magmeters have seen increased use in biotechnology industries in recent years. The characteristics of the liner make it highly desirable in sanitary applications. Ceramic liners can tolerate higher temperatures and pressures than most other liner materials. Other liners can also release plasticizers and drying agents into the product in a process referred to as leaching. Ceramic liners are much less likely to contaminate the process by leaching. One particular concern when using ceramic liners is thermal shock and the damage that can be done when inferior designs are subjected to large, rapid swings in temperature. Yeast is used in industrial processes such as the production of antibiotics, penicillin and other medicines, and in the fermentation of beer and alcoholic beverages. If the lines are not sterile, a yeast fungus can infect the process, and ruin the batch. Cleaning and sterilization between batches is an absolute necessity, and is often accomplished through the use of hot water or steam. 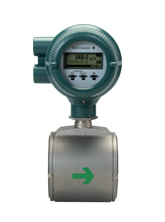 CIP (Clean In Place) and SIP (Sterilize In Place) applications can subject meters to drastic temperature fluctuations in short periods of time. These temperature swings can lead to a variety of failures in meters with inferior design and materials of construction. Electrode seals can fail due to differing expansion rates of the liner and electrodes, and inferior liner materials can crack and fail, causing leakage or loss of the measurement. Yokogawa's ceramic liner can offer the customer superior resistance to thermal shock and the failure that can occur due to liner cracking. This is due to Yokogawa's use of 99.9% pure Al2O3 for the liner. While the difference between our use of 99.9% pure Al2O3 and the competition's use of 99.7% may seem insignificant, the effect on thermal shock capability can be considerable. *Refer to Manufacturer's GS Sheets for details. Another major advantage of the ADMAG ceramic design is the electrode construction. All sizes of the ceramic lined ADMAG utilize a Platinum-alumina cermet electrode. The electrode is a mixture of Platinum/alumina powder which is sintered into the liner during the manufacturing process. The result is an electrode which is an integral part of the liner. This method of construction has several major advantages over solid electrode designs. The primary benefit is the elimination of two potential leak paths. Since the electrodes are an integral part of the liner, there is no seal to fail as with competitors' meters using solid electrodes. Another advantage that cermet electrodes have over solid electrodes is that the cermet Electrode and the Al2O3 liner have the same thermal expansion rates. With a solid electrode, the liner and electrode have different thermal expansion rates. Differing expansion rates can lead to improper sealing around the electrode and, over time, can contribute to stress cracks at the electrode/liner seal. Both can lead to premature failure of the meter due to leakage. A major biotechnology manufacturer recently conducted a year long test to evaluate the effects of thermal shock from CIP cleaning on mag meters with ceramic liners. The ADMAG completed the test with no problems, while meters from other manufacturers showed blistering and cracking. Some manufacturers even elected not to finish the test and withdrew their meters before the test was completed! Yokogawa's use of cermet electrodes and 99.9% pure Al2O3 allows the ceramic ADMAG to provide reliable service where our competitor's meters will most likely fail due to leakage around the electrode, or thermal cracking of the liner. This can offer your customer longer service life with less down time, lower maintenance cost, and lower overall operating cost.